OK, let’s just skip the pleasantries and cut straight to the chase. Ty Jerome killed them. From beginning to end and everywhere in between, Ty Jerome k-i-l-l-e-d them. That was one of the many take-aways from Virginia’s 81-59 destruction of Virginia Tech on Tuesday night. Not that it was surprising to any Hoo that saw Jerome’s ball fake and dagger 3-pointer at Cameron Indoor Stadium, UVA’s next stop coincidentally, last season, but it was eye catching nonetheless. With 14 points, 12 assists, 4 rebounds, 2 steals, and enough confidence to boost not only his teammates but the 14,623 in attendance, Jerome turned in an incredible performance in the first ever top 10 meeting between the old rivals. That’s the polite way of saying Jerome killed the Hokies. If this were The Sopranos, you could call what Jerome did merciless. If this were South Park, you could see all the different ways Jerome killed them. If this were Mortal Kombat, Jerome ripped their hearts out. If this were Fortnite Battle Royale, Jerome was the last one standing. OK, enough. You get it. Jerome got started immediately. On the game’s first possession, Tech poked the ball away but Jerome tracked it down and late in the possession he fired a look-away pass from the top of the key to an unguarded Mamadi Diakite for the layup. After the Hokies missed a 3-pointer, Jerome showed he really meant business on the next possession. With 15 seconds still on the shot clock, he spotted a defensive switch by the Hokies, took a retreat dribble back toward the Hokie sideline, and unleashed a long-range bomb that set the building on fire. That shot came one step in front of the coaching box marker that’s 38 feet from the baseline. That’s at least a 25-footer. There was no hesitation. No second thoughts. It hit only net. The New York junior’s attack never slowed and after those two plays, his team never trailed. In fact, Jerome contributed either the points or the assist on Virginia’s first 19 points as the team jumped out to a 19-11 lead. The Hokies didn’t stop that maestro effort either. Jerome subbed out for the first time at the 11:04 mark shortly after he passed to Jay Huff for a 3-pointer at the top of the key. Among those 19 points were three 3-pointers from Jerome and assists to three different players. He said the offense flowed through some ball screens and he just tried to make the right decisions during that fast start. Jerome’s giving spirit continued after he subbed back into the game. After dishing out four assists in the first nine minutes, he added eight more helpers the rest of the game. That pushed him to the top of the record books for assists at the John Paul Jones Arena with 12 on the night, surpassing 11 by Clemson’s Cliff Hammonds in 2008 and the UVA mark of 10 by Sean Singletary in three different games. The dozen included several dandies. Jerome spotted Diakite a second time in the first half with a little dump down pass for a dunk after avoiding the hedge on a ball screen. 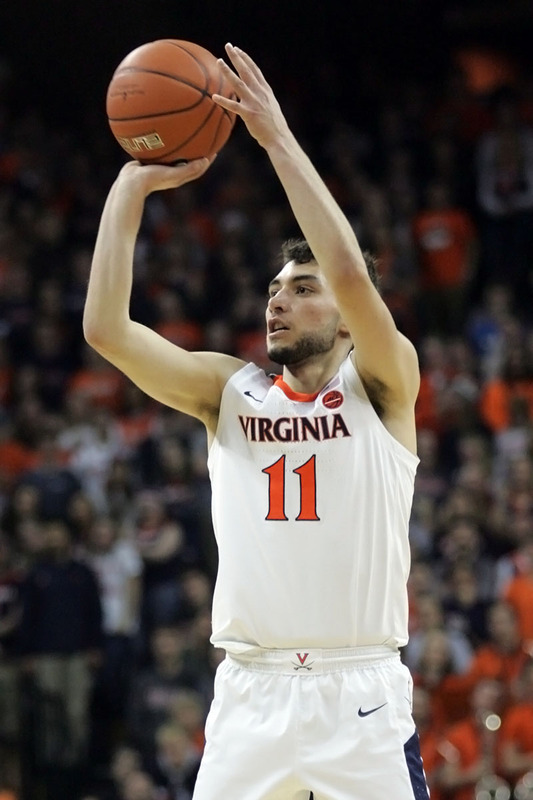 He hooked the ball over to Kihei Clark for a 3-pointer and fired a one-handed off-the-dribble pass across the court to Kyle Guy for a triple too. He also finished the first half with an end-to-end play that left the arena roaring. Jerome grabbed the defensive rebound on the block with 6.7 seconds to go, blew up the court and split two Tech defenders with only six dribbles, and flipped a pass to Clark in the corner for the buzzer-beating 3. As that shot swished home, Jerome did a hopping skip move in celebration and then shared a handshake routine with a widely smiling Clark. In the second half, there was more to come. On one drive, Jerome went from what looked like trouble late in the shot clock to a blind backward over-the-head pass to Braxton Key in front of the UVA bench. Key drained the 3-pointer jumper as Tim Brando exclaimed ‘How about that pass!’ on the Raycom Sports broadcast. Finally, for dessert, Jerome spotted Huff cutting toward the basket twice in the waning moments for two thunderous dunks. Could Jerome see the opening on all those assists or was some of it just a feel for where his teammates were located? Jerome kind of chuckled as he looked over to his teammates in the media room before answering. Jerome laughed after that last remark and, why not, he just had a huge game in an important early matchup in ACC play. That he rose to the occasion, particularly after a slightly off-kilter outing at Clemson on Saturday, wasn’t surprising. He had 8 points and 5 assists against the Tigers, but made just 3 of 9 shots and seemed a little out of rhythm for much of that game. There wasn’t even a hint of that Tuesday night. Hoo remembers Ty’s performance vs. Villanova his first year. Guys a serious Baller!